[The Pro-Matrix Curve] saves time and improves the contour of my restorations. This product is very convenient and easy to use and enables anatomical contacts. The swivel was helpful, especially when placing wedges and contact rings. You remove an old amalgam, clean out the residual decay, and there it is—an underlying tooth so damaged that there’s not much left for a dental matrix band to grab on to. Add bleeding and fluid contamination to the mix, and placing a new restoration becomes a challenge of semi-epic proportions. 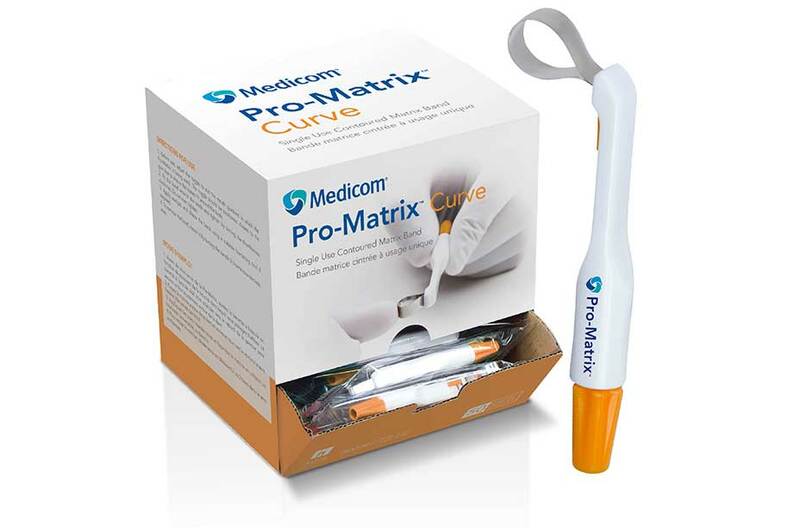 Medicom has sought to address this problem with Pro-Matrix Curve, a new, precontoured dental matrix band that grabs and holds on to teeth, even those with limited support. The curved band facilitates the restoration of interproximal anatomic contours and contact areas of the tooth surface while creating a smooth external surface against which restorative material can be packed. The convenience of a disposable matrix and band, which has been set up in advance and requires minimal adjustment, greatly enhances overall ease of use and simplifies the restoration process. “[The Pro-Matrix Curve] saves time and improves the contour of my restorations,” said Dr. Amir Noori, who performs approximately 140 restorations per month. 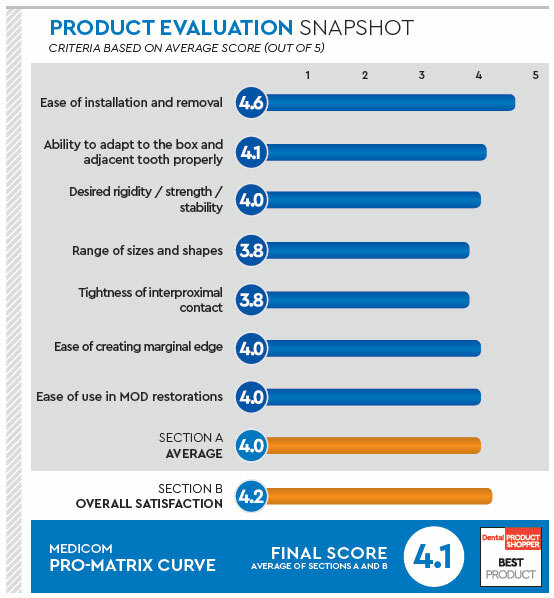 Dr. Noori and several other general dentists participated in this DPS evaluation, testing both sizes of the Pro-Matrix Curve—the 6 mm for use with molars and the 4.5 mm for use with premolars and children. The Pro-Matrix Curve offers a tapered, narrow neck to facilitate placement with improved visibility and access. The band is flexible enough to achieve a good contact point, even for composite restorations, and the seal created at the cervical portion of the tooth helps keep the prep clean and dry for easy placement of any material. New Jersey dentist Richard Ruden, DMD, described the Pro-Matrix Curve as easier to set up and use, while Scott Dubowsky, DMD, agreed and said it also saved time. Dr. Trupti Nadkarni also noted that the product reduced her chairside time. Citing ease of placement as his favorite feature, Dr. Eliot Ramer, who performs 80 to 100 restorations per month, said, “It took less time to place and wedge.” Similar feedback was provided by Alfred dela Cruz, DDS, who said, “I like the 1-piece design for quick placement,” and added, “The swivel was helpful, especially when placing wedges and contact rings.” Dr. dela Cruz said his assistant appreciated not having to sterilize the matrix, and Dr. Marc Henschel likes that the dental matrix bands are disposable. “I am an automatrix user and thought it was a better product as I did not need to have a tightener,” shared Dr. Edward Kusek. When asked about potential improvements, Dr. Nadkarni suggested, “The band needs to be a little wider for those deep interproximal root decay cases,” and Dr. Mark Mamari would like to see a transparent band for anterior resin restorations. The Pro-Matrix Curve is especially helpful in situations in which sections can’t be used, such as those involving large gaps between teeth, a missing adjacent tooth, a large and wide interproximal box, cusp replacement, amalgam restorations, and large MOD cavities. “MOD restorations were nice and easy to use this matrix,” noted Dr. dela Cruz. Calling it a great product with a better curve, Dr. Phillips said the Pro-Matrix Curve was especially advantageous in a case involving MOD of the second molar.